Many people suffer from entomophobia – an irrational fear of insects. Often, their first reaction is to recoil, or to stamp on them, or to reach for the spray can. In fact, most bugs are not harmful at all and many are beneficial. By not welcoming insects into our garden we are making a much harder job for ourselves. Just a Little Story: The very first street that that we lived in, when we first came to Sydney, was full of migrant families, like us, and lined with paperbark trees. I was thrilled to see these exotic trees suddenly burst into nectar-heady flowering that set the whole street abuzzing. Next thing, the sound of sawing! I rushed out to see my neighbour, and her very elderly mother, felling one of these trees on the nature strip outside their house. When I threw up my arms and asked them why she replied – too many bees!! They were not allergic to bee stings – just entomophobic. This kind of flowering border will attract all kinds of beneficial insects. Pests only become a genuine problem when there aren’t enough predators to control them or if seasonal conditions cause a temporary plague. So how do we make our patch a haven for good bugs and let nature do the work for us? 1. 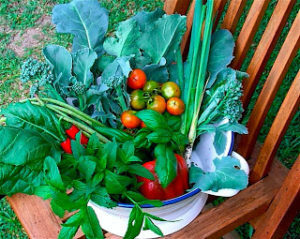 Well-fed plants – preferably nourished with compost and good quality mulch – are much less pest or disease prone. As always, the answer lies in the soil. the critters will be confused and hopefully fly off somewhere else. 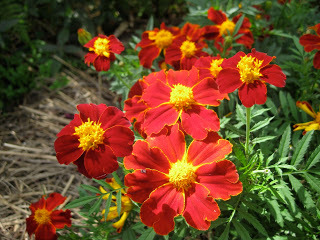 plants from other families will be unaffected by this pest so you will always have some food to eat. 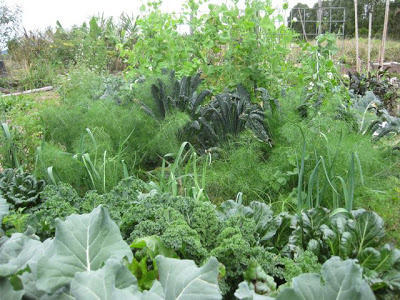 Blended families – mixing up brassicas (broccoli,kale, Asian Greens) with strong smelling plants from other families – like fennel, garlic and leeks. 3. 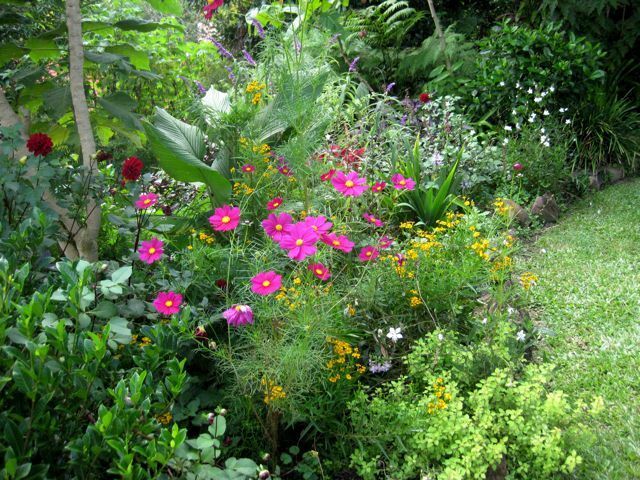 By integrating flowering plants with vegetables and herbs you are copying the greatest teacher of them all – Nature. FACT: The DPI (Department of Primary Industries) recently spent a day at our Community Garden in Mullumbimby looking to see whether a large integrated garden like that (i.e. everything all mixed up) had any impact on the insect populations. WHAT THEY FOUND – not only just about every beneficial insect you could think of but just about ZERO pests. The Praying(or preying!) 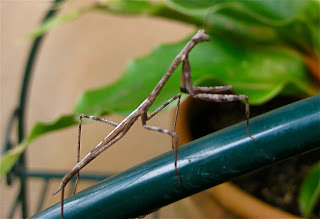 Mantid are useful because they are voracious generalist predators and are able to start consuming almost as soon as they hatch – so watch out aphids and potato beetles! SO, WHO ARE THE GOOD GUYS? Ladybirds (but not the 26 spotted one, which is a significant pest), dragonflies, damselfly, earthworms, earwigs, lacewings, robber flies, tachinid flies, mantids, springtails, wasps, chalcids, hover flies, leopard slugs, mole crickets, centipedes, millipedes, spiders. And these are just the insects – don’t forget about creating a safe, inviting habitat for birds and lizards. Jackie French ‘The Best of Jackie French’. 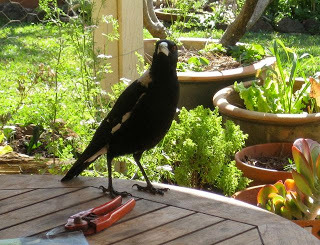 My mate Maggie would agree with her – she’s never short of a feed in my garden. HOW TO DESIGN A HEALTHY GARDEN? Go to my previous posts Kitchen Gardens: Top Tips for Getting Started and April in the Garden: Autumn Planting. WHAT SHOULD YOU PLANT TO ENCOURAGE BENEFICIAL INSECTS: Brightly coloured flowers with prominent stamens – like cosmos, dill, parsley, zinnias, echinacea, gaura, borage, dahlia, basil, cleome, flowering bok choy, marigolds. Don’t forget that all of these will also encourage pollinators for your fruit and vegetables. 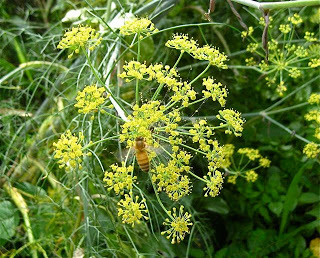 Dill in flower – with friend! JUST ANOTHER LITTLE STORY: We used to run an environmental pest control company in Sydney – specializing in the novel ideas of education and biological control – so entomophobes were our bread and butter. I vividly remember an hysterical woman ringing up one day who had seen a blue tongue lizard in her garden and was screaming at me to ‘just come round and kill it’ – little realizing that this harmless creature was performing a useful job by keeping down the slugs, snails and cockroaches etc. So don’t forget that lizards are your friends too – they just need a safe place to bed down for the night. 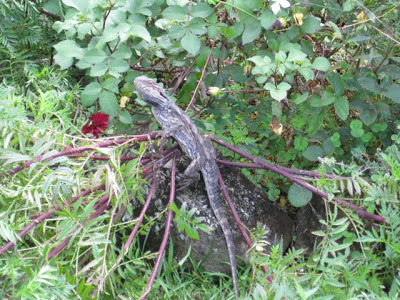 I used to have lots of lizards in my garden before the neighbours got free-roaming cats.